Bulletin boards are not one of my strengths. I struggle each time a board or display case needs to be updated -- this is not something they taught in graduate school! 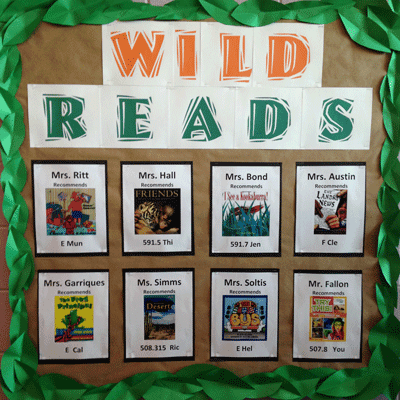 But I think I found one that works for me, in that it was not too difficult to put together, goes along with the school-wide theme (Wild About Learning), and encourages students to read something new. Every few weeks I plan to ask 8 staff members for a reading recommendation. The only rule is that it has to be something available in our Media Center collection. This month we asked one teacher from each grade, as well as the Media Center staff.